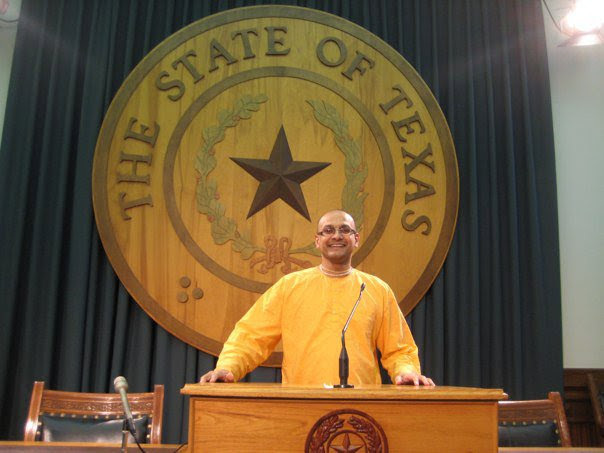 HG Gadadhar Pandit Das, a disciple of His Holiness Radhanath Swami. Gadadhara Pandit Dasa (also known as Pandit) is a monk, lecturer and the first-ever Hindu chaplain for Columbia University and New York University. He speaks at the nation's leading universities, yoga studios, and retreat centers, inspiring audiences with India's spiritual wisdom. His unique approach combines teachings of the ancient classic, Bhagavad-Gita, with popular Hollywood movies such as "The Matrix". Pandit spoke at a recent TEDx conference at Columbia University and was featured in the NPR piece "Long Days and Short Nights of a Hindu Monk". He appeared in the PBS Documentary on the Bhagavad Gita, as well as The New York Times. He is also a regular contributor for the Huffington Post. Pandit was born in Kanpur, India and moved to Los Angeles in 1980 as a child. After the collapse of his parents' multi-million dollar family business, Pandit began to introspect on the deeper meaning and purpose of life which led him to join a monastery in India, in 1999. Today, he is an urban monk living in New York City and uses his life experiences, teachings of the Gita, mantra meditation, and vegetarian cooking to guide and encourage people to live more balanced and wholesome lives. His life is chronicled in Pandit's autobiography: Urban Monk - Exploring Karma, Consciousness and the Divine. Please visit http://www.nycpandit.com for more details about him.